Wide receiver Larry Fitzgerald is a target every quarterback would love to have. A large part of this is due to his constant devotion to training and nutrition. 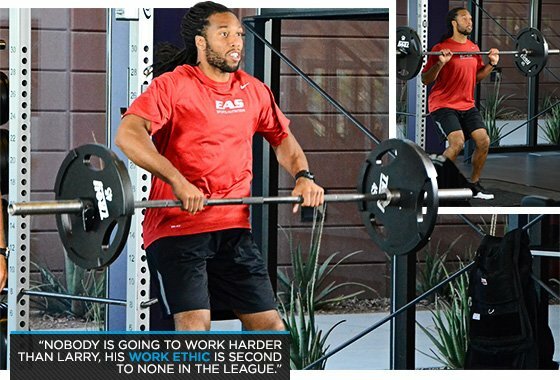 At 6-foot-3 and a lean 213 pounds, Arizona Cardinals wide receiver Larry Fitzgerald is the definition of a natural athlete. Watch him pull down seemingly uncatchable passes, and you can't avoid the conclusion that he would be one of the best wide receivers in the league even if he didn't spend a minute in the gym. And yet, before John Lott came on as the Cardinals' strength and conditioning coach in 2007, Fitzgerald's training program was far from scientific. "In the off-season, he was used to doing his own thing, and he had some semi-success with that," says Lott. Fitzgerald was like a stallion who had never been broken until Lott was able to rein him in. "Once I convinced him to tweak a few things, to his credit, he has had a lot of success," Lott says. Fitzgerald's new fitness strategies paid off huge in the next two regular seasons, when he led the league in touchdowns, but even more in the energy level he carried into the postseason. In 2008, Fitzgerald set the record for the most single-postseason receiving yards, totally dominating opponents' defenses en route to a Cardinals Superbowl appearance. Since then, "Sticky Fingers'" offseason preparation has become the stuff of legend. The Cardinals showed how much they believed in their franchise player by signing him to an 8-year extension at quarterback-caliber money in 2011. Here's how he gets it done. Though his youthful personality makes him seem ageless, Fitzgerald is no longer a spring chicken by wide receiver standards. Now 29, he's had his share of injuries and setbacks, making proper conditioning more essential every year. Luckily for him, "Nobody is going to work harder than Larry," according to Lott. "His work ethic is second to none in the league." Fitzgerald is known for staging offseason camps in his hometown of Minneapolis and inviting wide receivers from around the league to train with him. These have become a major destination for young players—after all, who wouldn't want to learn from one of the league's undisputed greats? But just because Fitzgerald shares the wealth of his experience doesn't mean he's going to let anyone get an edge on him. "I can never let the guy across from me be in better shape," Fitzgerald says. "I have to be the best-conditioned guy. 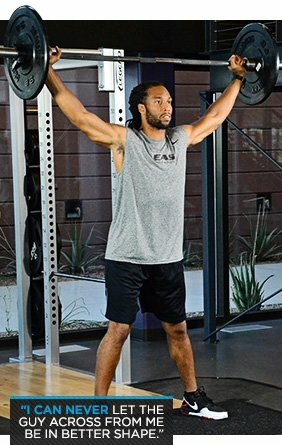 Fitzgerald usually lifts weights four days per week during the offseason, favoring Olympic lifts and plyometric movements that give him explosive speed and jumping ability. He also does cardio five days per week on average, switching between, treadmills, stairs, and spin classes. "I make my off-season training as hard as I can," he says. Nothing is random or disorganized in Fitzgerald's plan. Everything is built around the skills that a wide receiver needs: jumping, grabbing, and running. Not everybody is willing to take the "off" out of "offseason" like Fitzgerald does, but he says it pays off when he can line up against a different cornerback each week and say confidently, "You are not going to be able to stop me today, because I have dedicated the whole off-season and season to being able to beat you." In addition to taking it up a level during the off-season, Lott integrated more running workouts, plyometrics, and horizontal jumping like box jumps into Fitzgerald's in-season training routine. Fitzgerald admits he despises these conditioning techniques, but he can't dispute their value. "I know it's important for me and my position to be in peak condition because I have to run nonstop all the time throughout the course of a season," he says. A typical day during the season starts when Fitzgerald shows up at the Cardinals training facility at 6:15 a.m. He lifts weights for about an hour and a half to help enhance his speed and strength. Various squat variations make up his favorite portion of the routine. "For my position, you need to be strong," he says. "You need to be able to run and jump and cut and stop on a dime." From the weight room, Fitzgerald heads into team meetings for three hours in order to get to know the team's next opponent and develop a plan of attack. After that, he heads to the field for 2-3 hours of fieldwork and conditioning. 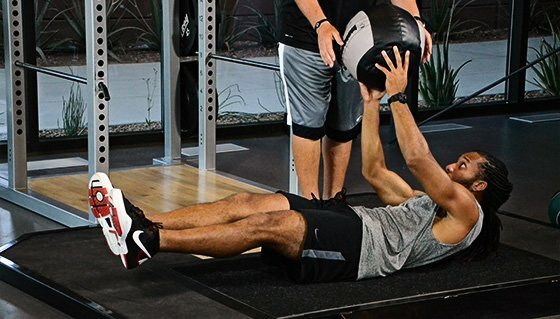 Once he's done on the field, he hits the gym again for some hand-strengthening—his paws are revered as some of the strongest in the league—and stabilization exercises. All of this occurs before lunch. In the afternoon, Fitzgerald attends another team meeting to break down film, and then he's done for the day. The rest of the day is spent recovering, spending time with his family and getting at least eight hours of sleep in preparation for the next day's equally rigorous workouts. One of the biggest differences between young Fitzgerald and mature Fitzgerald—aside from his longer hair—is the care he takes when it comes to nutrition and recovery. He favors a high-protein diet with lots of greens, healthy whole grains, and plenty of water. 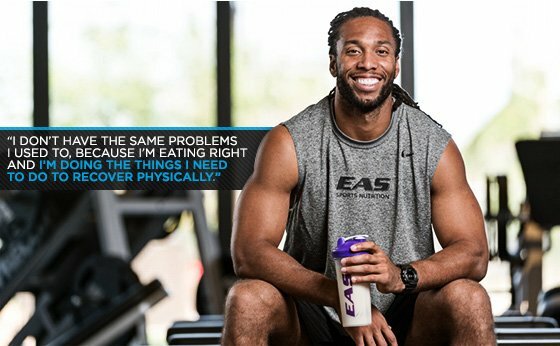 He also uses EAS Myoplex® Original shakes and Myoplex 30™ bars to fuel up throughout the day and Muscle Armor® post-workout, which he says helps him recover from his intense training.